What is the reaction in the pit of your stomach when you get a letter in your mail from the IRS? Maybe you don’t get those occasional letters. I do. As you sort through your mail, you come across that one which says “Internal Revenue Service” in the upper left hand corner. And every time I get one, my heart skips a beat, and my stomach jumps into my throat. Oh, it’s not because I’m scared. I pay my taxes. I don’t cheat the government. But just the thought of getting audited, or getting some sort of official document from the most dreaded government agency of all time is enough to raise your stress level a bit. And you say, “But I already paid my taxes.” They tell you it doesn’t matter. There was a tax hike in your community, and you get to pay it. “I didn’t read about this tax hike in the paper” you object. “We’re telling you about it right now,” they rasp. Well, I don’t need to carry this out much further here, but if that were to happen, people would dislike the IRS much more than they already do. They would be seen as licensed crooks. They would be hated. They would be despised. They would be feared. People would shun them, avoid them, stay away from them. But this is very close to the way tax gathering was done in the time of Christ. At that time, there were two kinds of tax collectors, the Gabbai and the Mokhes. The Gabbai were general tax collectors. They collected property tax, income tax and the poll tax. They had a poll tax which everybody had to pay whether they worked or not. It was a tax just for existing in the Roman empire. Then there was ground tax which consisted of one-tenth of all grain grown, and one-fifth of all oil and wine. You could pay this with the grain, oil and wine, or with money. Then there was the income tax, which was one percent. These taxes were set by official assessments, and so there was no much room for the Gabbai tax collectors to take more than what was due them. The Mokhes, however, collected a duty on imports and exports. They would set up toll booths on roads, harbor docks and bridges and could tax almost anybody for anything that moved along the road. You could be walking down a road which you have been using for ten years, and all of a sudden, a tax collector sets up his booth on that road, and starts charging people for using the road. And the tax was worse if you had a cart. You had to pay extra for every wheel on the cart. And if the cart was being pulled by animals, that was extra also. The tax collector could tell the man to open his packs and bundles of goods, and tax him whatever he wanted. And in all of this, there was very little governmental control. Only the tax collectors and the government knew what the tax rate was, and it was always changing anyway, so the tax collectors could basically charge the people anything they wanted. And on top of this, there were two kinds of Mokhes – the Great Mokhes and the Little Mokhes. A Great Mokhes stayed behind the scenes and hired others – the Little Mokhes – to collect the taxes for him. Zaccheus, by the way, was probably a Great Mokhes because Luke 19:2 calls him a chief tax collector. And these Great Mokhes were hated by the Jewish people. But it was the Little Mokhes who were despised the most. He was the one people saw and interacted with. He was the one who set up random toll booths on roads and bridges and charged people anything he wanted. If you got angry at him for dumping your possessions all over the road, he could tax you more and there was nothing you could do about it. In any culture, such tax gatherers would be despised and hated. But they were hated and despised even more so in Israel. Why? Because these tax gatherers were considered to be traitors. The Roman government always had a difficult time collecting taxes from the Jewish people, because many of the Jews had no qualms whatsoever about killing a Gentile who wanted to take their money to support the pagan Roman government. Eventually though, the Roman government found a way to collect their taxes and keep their tax collectors from getting killed. They hired Jewish people to collect the taxes for them. Jewish zealots who didn’t mind killing Gentiles would never think of harming another Jew, even if they viewed this Jew as a traitor. And the Roman government had a curious way of paying their tax collectors. They told the tax collectors how much money to send in to the government. Anything that the tax collector could get above and beyond that amount could be kept for himself. So the tax collectors became greedy, and often extorted money from their own Jewish people. They would often use thugs to strong-arm people into paying far beyond a reasonable amount. Because of this, they were despised, hated, and scorned by the other Jewish people. All of this brings us to our text today where we encounter a man named Levi. He was a Jewish man who collected taxes for the government using Mafia techniques. Not the kind of guy you want to have around. But Jesus is never constrained by cultural stigmas. In fact, as we saw a few weeks ago with the leper, He always loves those that are outcast and looked down upon by society. In Luke 5:27-32, Jesus calls sinners like Levi to follow Him. Jesus is out in the town, and he sees a tax collector named Levi. This Levi is most often called Matthew in the Gospels. He is the one who eventually writes the Gospel of Matthew. In fact, after this account, he is never called Levi again in the Gospels. Many people in the Bible have two names – one for before they met Jesus, and one for after. Simon became Peter. Saul became Paul. Levi becomes Matthew. Levi means “joined” whereas Matthew means “gift of God.” And in Luke 5, we see that Levi receives the greatest gift of God that there is. Alfred Edersheim, a Biblical scholar and historian, thinks that Levi followed Jesus about and taxed the crowds that came to hear Jesus teach. 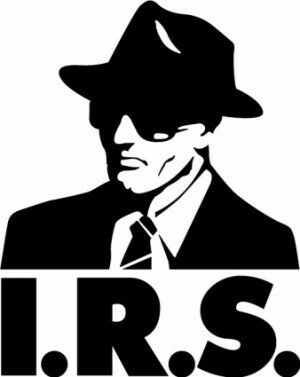 Imagine if you came to church next Sunday, and there was an IRS agent standing out there taking down names and social security numbers to see if you paid your taxes. It would probably dampen your desire to come to church. That’s kind of what Levi might have been doing. 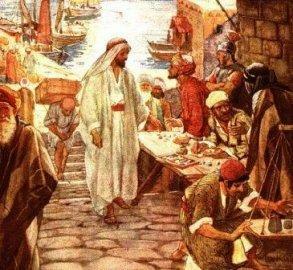 He followed Jesus around and taxed the crowds who came to hear Jesus teach. But as Levi sat there with his booth, taxing people who came to hear Jesus teach, he also got to hear the teaching of Jesus for Himself. This was probably like water to a dusty soul. You see, tax gatherers were not allowed to come into the synagogue to hear the Word of God taught. Levi was able to hear truths from Jesus that he had never heard before. All his professional life, he had been told that he was headed for hell. All his life, he had been told that it was impossible for God to forgive him. But Jesus taught the exact opposite. Levi kept showing up – to hear the words of Jesus. I doubt Levi’s presence bothered Jesus. It certainly bothered the crowds. They didn’t like tax gatherers, and they didn’t like to get taxed. But there was nothing Jesus could do – except one thing. Rather than asking Levi to stop coming around, Jesus asks Levi to become one of his disciples! Incredible! Technically, if Levi had been following Jesus about, he had long ago become one of Christ’s disciples, but he never dared dream that Christ would recognize him as such. He never dared dream that Christ would speak to him. He never dared dream that Christ would invite him to become a follower. I love this about Jesus. There are people who think they have sinned too much to have Jesus love them. But He does. There are people who think they have made too many mistakes to have Jesus notice them, or care about them. But He does. Jesus doesn’t care that society hates Levi. Jesus doesn’t care that Levi is wretched sinner. He just wants Levi to follow him. And look how Levi responds in Luke 5:28. Luke 5:28. So he left all, rose up, and followed Him. This is nearly identical to what we saw Peter do when Jesus called him to be a fisher of men. Back in Luke 5:11, Peter, James and John left all and followed Jesus. Levi does the same thing here. He left his street thugs behind. He left his tax gathering booth. He left all the money, and rose up and followed Jesus. This was a once in lifetime opportunity for Levi, and he knew a good investment when he saw one. On the one hand, he could continue to be a tax collector, earning piles of money, but continue to have everybody hate him and despise him. Or, he could leave all his money behind, and follow Jesus, where there was love, and acceptance, and most of all, forgiveness. It’s not even a choice he had to think about. He just got, left all, and followed Jesus. Very likely, the tax gathering booth did not stay empty for long. Although being a tax gatherer cost you your friends and family and the respect of your neighbors, it gave you great wealth, and there are always people who will do almost anything for money. In that society, just like in ours, there were men who were willing to be seen as a traitor if they could just become rich. Though tax collectors were hated, there were always people ready and waiting to become a tax collector. Once Levi left his booth, that was like turning in his resignation. There was no going back for him. They probably had his position filled within a day. But He didn’t care. Though he had been serving money for years, and had spent his days trying to get just one more denarius, he finally found in Jesus what he had been searching for. Maybe, many years ago, he had thought that having lots of money would give him satisfaction and fulfillment in life. Now, he had all the money he ever wanted, but he was still not happy. But when Jesus came along, and asked Levi to follow, Levi knew that Jesus was what he had been looking for. Whereas money could never fill the hole in his life, Jesus could. The cost of leaving everything behind to follow Jesus was well worth it. What would you give up to follow Jesus? Are there things in life that you have been searching for which you thought would give you fulfillment and satisfaction? Maybe you have even sinned a lot in order to achieve these dreams. You’ve cheated and lied and cut corners. Maybe you’ve made a lot of mistakes in life. If people knew half of what you’ve done, they would never want to be near you again. But do you want to hear something amazing? It doesn’t matter to Jesus. He is calling you. It doesn’t matter what is in your past. It doesn’t matter what is in your life right now. He wants you to follow him. It doesn’t matter what other people think of you. You are someone He wants by His side. You don’t have to fix your life before you follow Him. Just follow Him right now. This is what Levi did. He left all and followed Christ. Let me clarify something though. This is very important. Following Jesus is not the same thing as believing in Jesus. Following Jesus, and obeying Him, and even loving Him, will not guarantee you eternal life. Only believing in Jesus gives you eternal life. God gives eternal life only to those who believe in Jesus Christ for it. Today, and in the months ahead as we study Luke, we will be talking a lot about discipleship and repentance and following Jesus. None of these things give you eternal life. Faith alone in Christ alone is the only condition of eternal life. These other things are good things to do, and things that all of us should do, but they will not give you eternal life. Take Levi, for example. I don’t know if Levi has eternal life or not at this point. We aren’t really told. All we are told is that he left all and followed Christ. If Levi did not have eternal life prior to this event, his actions here did not allow him to receive eternal life either. We are not given eternal life because of good works. If Levi did already have eternal life, then his actions here are a decision to become a dedicated disciple of Jesus Christ. Levi, like everybody else, receives eternal life by believing in Jesus Christ for it. You do not receive eternal life by turning from sin. You do not receive eternal life by repenting. You do not receive eternal life by following Jesus. You receive eternal life by believing in Christ alone for it (John 3:16; 5:24; 6:47). You see, repentance is for all men (Acts 17:30; 2 Peter 3:9). Non-Christians can repent and follow Jesus. This does not give them eternal life, but it may lead them to believe in Jesus later for eternal life. But repentance is not just for non-believers. It is for believers also. All of us who have believed in Jesus constantly struggle with sin every day. And if we are going to continue down the path of discipleship with Jesus, we are going to have repent of the sin in our life that He brings to light. So I don’t know if Levi was a believer here or not. If he wasn’t, then his decision to repent of his sin, leave all, and follow Jesus eventually leads to him believing in Jesus for eternal life. If he was a believer, then he is simply deciding to leave a sin that was still in his life, and follow Jesus through greater commitment and obedience. There is only one condition for receiving eternal life – and that is believing in Jesus Christ for it. But there are many conditions for becoming a committed disciple and follower of Jesus Christ. Repentance from sin is one of them. Following Jesus is another. And it is when we admit that we are a sinner and repent of our sin, that Jesus comes to fellowship with us. Luke 5:29. Then Levi gave Him a great feast in his own house. And there were a great number of tax collectors and others who sat down with them. Although Levi had quit his job, he hadn’t left his house or all of his money. He had simply stopped working at his sinful profession. And now, one of the first things he does is have a party for Jesus and invite a bunch of other tax collectors. Why the tax collectors? Because these were the only people he knew. He didn’t know any religious people. He didn’t know any of the social elite. He didn’t know any upright and socially acceptable people. They would never want him for a friend. So Levi just got together those friends he did have, and invited Jesus over for a meal. Levi has found what he was looking for in Jesus, and he wants to share Jesus with as many of his friends as he can. By the way, studies tell us that generally those who are most effective in evangelism are those who have just started following Jesus. Why is that? Because they still have friends who are not Christians. When they believe in Jesus for eternal life, and discover that He forgives them for all of their sins for free, they love to tell their friends about it – just as we see Levi doing here. But generally, the longer one is a Christian, the fewer non-Christian friends he or she has, and so evangelism tapers off. This is why it is so important to make sure that we maintain contact with non-Christians and continually show compassion for them. We do not have to take part in their sin, but we do need to be part of their lives. When we follow Jesus, Jesus also wants to follow us into our homes, and workplaces and among our friends. Jesus has no qualms about sitting down for a meal and having a good time with those whom society considers “the sinful people.” Look who is at this great feast. Luke says that there were a great number of tax collectors and others. From a cultural viewpoint, a tax collector was on the same level as a prostitute (Matt. 21:32). The religious people and the upright citizens didn’t want to have anything to do with either, but Jesus loves both and shows compassion toward both. Here we see him sharing a meal with tax collectors. And look how the religious rulers react in verse 30. The scribes and Pharisees remember, were so concerned with remaining separate from sinful society, that they would never allow themselves to get near somebody they thought was sinful. They believed in guilt by association. They did business as much as possible only with other Pharisees. When they traveled, they stayed with other Pharisees. They lived inside a little Pharisee bubble. Talking with a sinner or touching a sinner was bad enough. But sitting down and sharing a meal with them was about the worst thing you could do. In their minds, sitting and eating with a sinner was the same thing as endorsing the sin. And so they condemn Jesus and his disciples. They say, “What is He doing?” If he wants to be respected and well like in society, he needs to hang out with different people. Their message to people outside their little legalistic bubble was that people need to believe like them, dress like them, act like them, like what they like, and don’t like what they don’t like in order to be accepted. Sound’s like us Christians sometimes, doesn’t it? The assumption we sometimes make is that only people who are genuinely interested in God are those who are interested in church and the way we do Christianity. But this is simply not true. I wonder sometimes if Jesus would “fit in” at some churches today. You see, Jesus did completely the opposite of many Christians today. 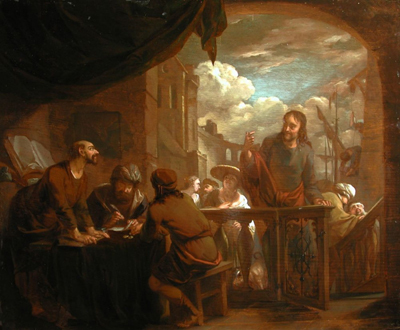 He reached out to people that everybody – both the Pharisees and society – considered sinful. And he did it in a way that offended the Pharisees. He certainly didn’t join sinners in their sin, but He did join with them in every other way. I’m not sure what he would do today. Have prostitutes over for dinner? Become best friends with the child molester? When the Pharisees saw this, they had a conniption fit. They were horrified. This is always how the self-righteous react when Godly people reach out in loving ways toward those whom society considers sinful. But he reaches out to them, not just so that He can befriend them, but so that He can call them to repentance. Jesus draws an analogy here between the sick and sinners. When you are sick, what is it you do? You go to the doctor. You seek out help. You expect him to give you medicine or tell you something to change in your lifestyle that will help your health improve. Similarly, Jesus has come to help those who know they are sinners. Just as healthy people don’t need doctors, righteous people don’t need repentance. Of course, there are lots of sick people out there who think they are just fine. And similarly, there are lots of sinners out there who think they are pretty good people. There are people realize that although they sin occasionally, they’re really not all that bad. Jesus didn’t really come for these sorts of people. Jesus doesn’t spend a whole lot of his ministry trying to convince people that they are sinners. Sometimes He does, though usually it is the religious people He tries to convince, not the non-religious. This is usually the opposite of the way churches do it today. We try to point out the sin in all the non-religious people, while we sit back and try to act holy and righteous. When Jesus pointed out sin, it was usually just to the religious people. But most of the time, He didn’t focus on sin at all; He just helped those who already know that they needed His help. This is because it is the Holy Spirit’s job to convict people of their sin (John 16:8). And the Holy Spirit does this through our conscience and the Word of God. Jesus is not going around trying to convince people that they need His help. He focuses on those who already know they need help. And when they come to Him for help, he doesn’t give them some purple, grape-flavored placebo to make them feel better about themselves for a few hours. Nor does he try to cover over the effects by giving them some pain killers and nice music to listen to. Oh no. Jesus goes right for the root of the problem and gives them the cure. He tells sinners that their problem is sin, and they need to stop sinning. When sinners come to Him for help, He tells them to repent. Although Jesus wants you to follow Him no matter what sin is in your life right now, He doesn’t want you to remain in that sin. He wants you to become aware of it and repent of it. 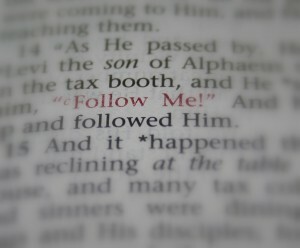 Jesus wants you to follow Him. Will you respond to the call? It begins with recognizing you are a sinner and that you must turn from your sin in order to become a disciple of Jesus Christ. This passage is not about other people. It is about me. It is about you. Don’t deny that you are a sinner. Don’t ignore or excuse sin either. A lot of people recognize that they sin, but it’s too much trouble to deal with it now, or they figure that it’s not so bad, because other people do worse things. Don’t try to treat yourself either. There is no home remedy for sin. You need to go to the great physician, Jesus Christ. And do you want to know what He will tell You? Repent. Let each one of us humbly repent of the sin that is in our own lives and leave all to follow Jesus on the path of discipleship. And even more importantly, let’s make sure that we associate with the people that Jesus would associate with. He loved to spend time with people that society and “religious” people rejected. Ask yourself, “Who are the people that probably won’t come to church on Sunday, and how can you show Christ’s love to them?” There are many people that all of us come into contact with who may never come to church unless we go to them first. That is what Jesus did. If we are Christ’s followers, we will do the same thing. Christ is teaching his disciples how to be fishers of men. The fishing tip he gives them here is if you want to catch fish, go where the fish are. A very good reminder of the example of Jesus, going to the needy where they are. I know an evangelistic group that did just that, for many years. They went where the fish were, the fringe dwellers , the losers and the so called lower economic strata. Their evangelistic efforts were very successful. They grew quickly. But over the years this group has gradually become middle class and respectable ….and is fading. It became an organisation, and an establishment, and organisations need money.There is not much money to be collected among the lower orders. Sadly it appears that we now have churchianity that needs money, and the church has gone where the money is; middle class wealth. Jeremy has challenged us to what we would give up to follow Jesus. What would we give up to follow Jesus into those unsavoury places where He goes. 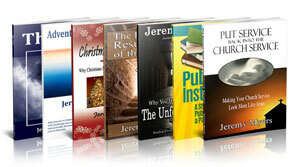 And what would the church give up to follow Jesus, into the disreputable places where the disreputable people are. Jesus didn’t find Levi in the Temple listening to the priest’s sermons. Jesus has never call sinners his friends. It is those who obey His commandments in other words those who are born again and living holy lives (=Saints) that Jesus calls Friends not the sinners who continuously grieves His heart by living a Life leading them to a place where they will be separated Jesus that place is Hell Fire. Plus the sinner sides with satan to stand against God and His Holy perfect standard of living. Though Jesus loves everyone He is not friends with everyone: He is only a friends to those people who have repented of all their sins and have followed his examply holy life of love and humility and obedience to the Father’s will. Think: why would He cast away His friend into a place where they will not see Him again: it doesn’t make sense. Before, because of being sinners we were the enemies of God but after repenting of our sins and receiving Jesus and starting and continuing to obey Him (=obey His Word) only then are we His friends. Let God’s Word be our guide not man’s tradition or man’s own idea. God bless you and help you be His friend and go Heaven your predestined place.